All sleepers are intact and rail connectors in place. Layout as shown fits on a 8ft x 4ft baseboard. Will need a clean before use but otherwise in good condition. All are steel and made in England. This is a 00gauge track layout consisting of a large loop, an inner loop, 3 points and a siding. It measures 41"(104cm) X 68"(173cm) so,it would fit on a 6'x4' board. It is in good condition with no sleepers broken and all fishplates present. 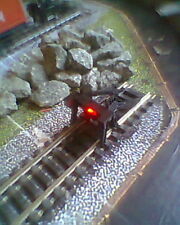 It has been tested and all works(2 point clips are wired so the train works on all tracks). It is made up of 8-R609 curves 7-R605 curves 12-R600 straights 1-R600 power straight track 1-R604 curve 1-R643 curve 3- Lima double straights 2-R8072 L/H points 1-R8073 R/H point 2 power clips 1 buffer stop. Included is a plan of this layout if needed. It will be packed well for posting . U.K. Bidders only please. : 2 x R610 Straights : 6 x R8073 (R/H) Points. As pictures, VGC ex layout. 00 GAUGE LEVEL CROSSING IN SUPERB CONDITION. MAKE A GOOD PROJECT. This oogauge train layout is built on an mdf board and measures 66"(168cm) X 41"(104cm). It is in a very good condition. There is a large outer loop of track with points going in and out to an inner loop, through a tunnel and to a station. Also there is another point to a long outer siding. Included is a controller and transformer. Everything is fixed down except the station, platforms, and cars. I can deliver it up to 50 miles radius if needed. This is a Hornby Skaledale 00 (1:76) scale resin model of a large house ( Item R.8561 - 'Aswell House') that has been removed from a layout on dismantling, and is in excellent unboxed condition. See the pictures . . POINTS x3 SUIT HORNBY BACHMANN ex LAYOUT 00 gauge HORNBY ? SOLD AS PICTURES, LOOK NEW UNUSED. LORD VERNON'S OLD OFFICES. SUDBURY JUNCTION. POINTS x3 SUIT HORNBY BACHMANN ex LAYOUT 00 gauge HORNBY ? . With back yard, washing line, children playing. Hand made scene using various materials. 00 GAUGE BUFFERS JOB LOT. As pictures, VGC ex layout. FINALLY CLEARING FROM MY HUGE COLLECTION. 0-6-0 LMS Locomotive with 1 Mineral Wagon and 2 Bolster Wagons. The loco is in good working order. 1 Bolster Wagon has a broken coupling. Two rail connectors are missing - one off a short straight andone off a point. HORNBY goods shed for oo gauge model rail layout. Condition is New. Dispatched with Royal Mail Signed for 2nd Class. HORNBY 00 POINTS. LORD VERNON'S OLD OFFICES. SUDBURY COURTYARD, SUDBURY HALL. SUDBURY JUNCTION. Model Railway track layout, 180 x 120cm. Fits Hornby trains. 180 x 120cm layout on sturdy 12mm ply wood. Hornby Double Note Scale 8x4ft Layout. Condition is Used. Collection in person only. As pictures, VGC ex layout. 00 GAUGE RAILWAY HOUSES IN SUPERB CONDITION. NEEDS GLAZING ETC. MAKE A GOOD PROJECT. FINALLY CLEARING FROM MY HUGE COLLECTION.